IDS 2019 AND TEAM FUN! Hello! Welcome to my blog! It is great to have you here! In this instalment some of my team members from my Architecture firm in Costa Rica had recently come to visit me in Canada! This blog post (and the next after this one) will showcase some of our fun moments during their trip here. 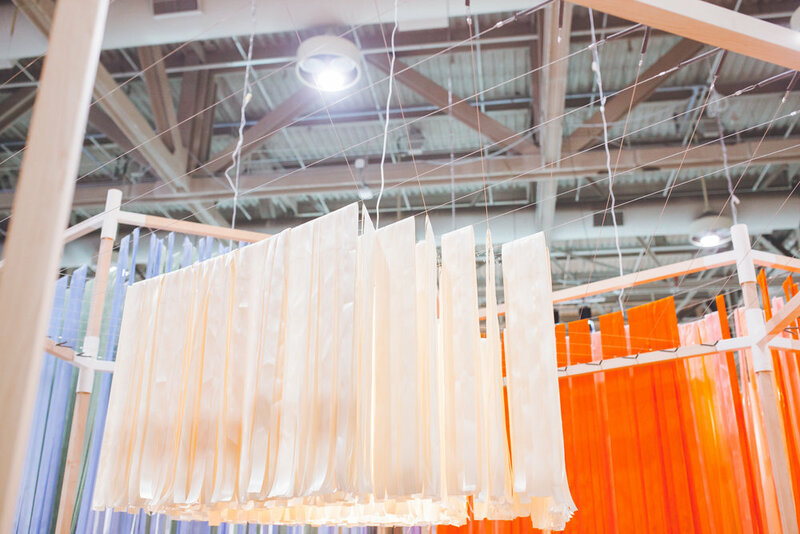 Moments that included a a trip to the 2019 Interior Design Show. The Interior Design Show (IDS) is an annual event that takes place over four days in January. It showcases some of the best and innovative interior design products and talent from around the world. There are also a number of speakers from a wide variety of backgrounds who give talks on their work and a wide variety of design related topics. 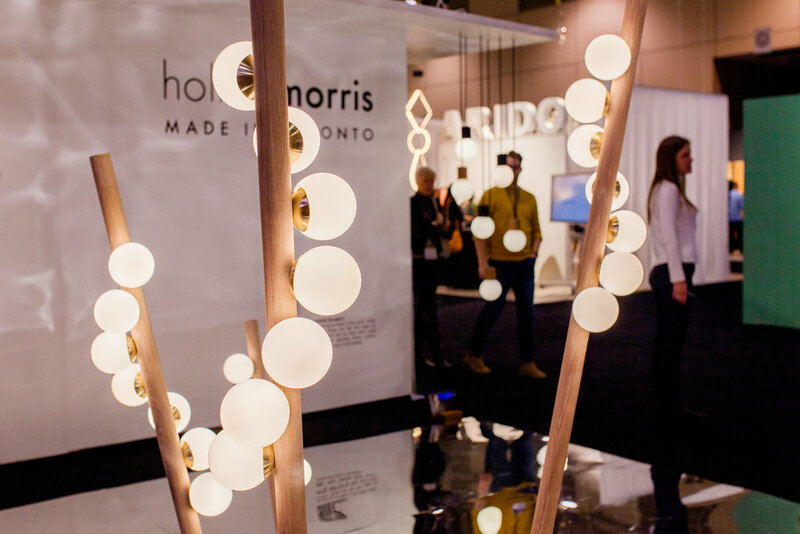 Lighting designers Hollis +Morris had a beautiful display. I absolutely love their lighting designs. Ontario Wood’s booth display and they had a neat installation. The whole team had to pose for photos. A portrait of myself with the structure. This is Ani Our Costa Rican Architect from our Costa Rican office. Here is Karimah (Our photographer and landscape designer) here at KMD Group. Here is Marcela who is the managing director at KMD Group! This is Diego. He is a Costa Rican Architect from our Costa Rican office. This is Philip who is our Project Manager at KMD Group in Canada. Here was one of the showstoppers at IDS. It is the Concept House “Great Lakes Cabin” that was designed by Backcountry Hut Company (BHC) with landscape design by Flattery Design. The team (minus our photographer) in front of the cabin! At IDS we came across this exhibition by Dutch designer Marije Vogelzang called the “Intangible Bento”. It was quite interesting as it invited visitors to take a walk through the ribbon filled installation. Inside we got to try some delicious samples of food such as flatbreads made in front of our eyes , and Apricot and Seed Balls. Do you know how they made flour back in the day? Well now you do. Fresh Flatbread Samplers? Yes Please! These seed and apricot balls were delicious! Stuffed Pasta Shells in the making. Well? What Inspires you??? A display by the Ryerson School of Interior Design (https://www.yesrsid.com/). We came across this company that produces Space Optimization Furniture and the representative gave passersby a quick look at how desk tables could be turned into dinner tables and cupboards could be turned into workstations. Testing it out for myself. 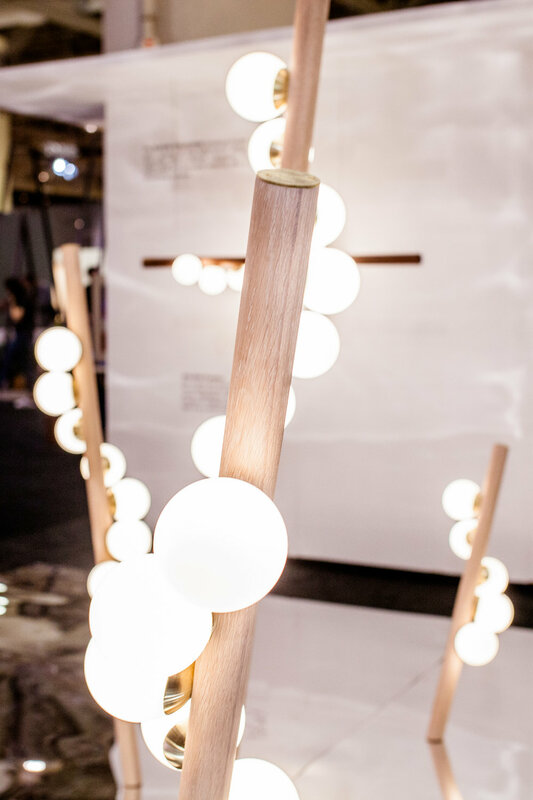 The display by VYVYD Lighting. The display by Miles and May. They sell high quality wood furniture. This was the stage setup. We took photos with one of the Main Stage Speakers the designer Michael Sorenson . One of the other speakers whom we truly enjoyed listening to were Neri and Hu (pictured below (photo credit: IDS 2019 website). They were invited by IDS as the headliners and International Guests of Honor. We really enjoyed their talk so much that we actually forgot to take photos during the actual talk. Here is a short description of them as described on the website of IDS: Neri and Hu are an interdisciplinary practice based in Shanghai with an office in London. They have won numerous international awards such as the the PLAN Award (2018), EDIDA Designers of the Year (2017) and Wallpaper* Designers of The Year (2014) to name a few. Neri & Hu strongly believe in research as a design tool, their work draws from the dynamic interaction between experience, detail, material, form and light. EQ3 is a store that sells furniture that are “Modern Designs for Everyday Living”. The Interior of a shipping container display by the group “Giant”. The exterior of the shipping container. The carpet display by W Studio. This DJ was spinning some cool tunes. I love to take photos with interesting people. Check out this guy’s hair and beard. A wall of Kitchen appliances. The WrKkit workspace by SDI Design Inc. According to their website” WRKkit is a life size kit of parts that can be reconfigured into thousands of configurations according to one’s ‘workplace personality’”. We came across these beautiful Ottomans by the Guelph based company “Ottomn”. Stumbling upon these cloud like things, we were curious to know what they were. Turns out they are from a company called Tangible and are known as “Haven”. Haven is an inflatable cloud structure and it has been conceived as a place to relax, meet or simply take a moment. Naturally our team had to go inside and check it out for ourselves. Okay folks that brings me to the end of this beautiful blogpost! Above was our last photo at IDS 2019. It was a lovely show and we tried to see as much as we could in the short time we had. We all absolutely loved the Interior Design Show this year! The displays were amazing and we were fascinated by the speakers at the main stage. They were all great! We look forward to returning to IDS in 2020! Until next time I wish you love and light as always.